Trump’s arrival to power has been a politically devastating event. Yet it should not be read as exceptional but rather as another chapter in a chain of conservative restorations sweeping world politics in recent years. Its starting point can be, perhaps, retraced back to the dragging of the Arab spring into a vortex of war and dictatorship (2013), followed by the election of BJP in India in 2014 and of extremely conservative governments in Hungary (2014) and Poland (2015). From April 2016 on, we have witnessed the Brazilian parliamentarian coup, the Philippines’ election (May),the Brexit referendum (June), Erdogan’s state of exception in Turkey (July), the defeat of the peace agreement in Colombia (in October) and the continuation, through elections, of a corrupt authoritarian regime in Nicaragua (November). Crises are underway in these various settings, such the wave of extra judicial execution in the Philippines, the effects of draconian fiscal policies approved by the Temer government in Brazil and, coinciding with the US elections, the disarray created by the de-monetization underway in India. But resistance and contestation are also mushrooming everywhere. As insightfully noted by akshay khana, the Indian SPW partner, a door has now been opened for much to be shared politically, on equal grounds, between America and the world. Here is what I wrote to a former student in Berlin: “Of course, we’ve all been going through a roller coaster of different emotions—first and most heavily, a kind of grief and mourning, for those of us in my generation (and younger too), a feeling that everything we’d worked so hard for all our lives was being flushed down the toilet. Then great fear and apprehension about the repercussions for vulnerable communities—people of color, Muslims, immigrants, people with disabilities, people living in poverty, indigenous and native peoples—and for the environment; and consequently for our work, since we’ll be called on to act urgently to protect these communities and defer longterm projects and campaigns (e.g., BDS)”. But since Wednesday 11/9th – the day after the election—the protests and marches have if anything accelerated, with tens of thousands in the streets and refusing to accept Trump and Trumpism quietly. Participating in and watching those protests has been sort of healing and brought back a sense of hope and unity. Yesterday our JVP chapter held an all-day retreat –planned long before the election — and it was interesting to hear a definitely leftist perspective emerge about the « silver lining » in Trump’s election, how, if Hillary had won, we would be going on with business as usual and less mobilized and urgent about the deep racism, misogyny, and authoritarianism that have been there for ages. I have to confess to being rather pulled by this view—it seems undeniable—at the same time as the immediate consequences, especially for undocumented people, children, Muslims, so many people being harassed in their schools and the streets, social service programs terrified they’ll lose funding, those who will lose their fragile health care benefits, are horrible. Trump has appointed the most extreme-right guy, Steve Bannon from Breitbart News, to be his advisor, right there in the White House – and this guy is not only a vicious white supremacist but also an arch anti-Semite – even though Trump’s son-in-law and daughter are Jewish! So the horror and contradictions abound, and it’s very ominous. Yet people are mobilizing – and who knows? Maybe a huge cross-sectoral, multicultural opposition movement will solidify, thanks to Trump. We can only work hard for it, and hope. Click here to access the full compilation of articles and news reports. 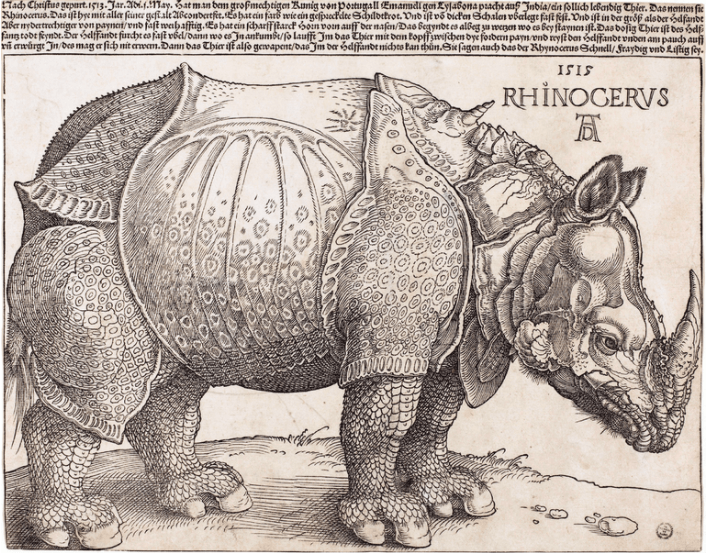 Image: Albrecht Dürer’s “The Rhinoceros” (1515- National Gallery of Art) that illustrates Teju Cole’s article in the NYT, included in the compilation, compellingly calling for the normalization of the election results to be refused and resisted.